A paper published today in Palaeogeography, Palaeoclimatology, Palaeoecology finds that the last 4 interglacials were up to 3C warmer than the current interglacial and were characterized by sea levels up to 79 feet [24 meters] higher than the present. According to the authors, "The most conservative estimates of palaeo-sea level during [the interglacial ~400,000 years ago] would require an ice mass loss equivalent to all of the modern Greenland and West Antarctic ice sheets; the more extreme estimates would require additional ice mass loss from the East Antarctic ice sheet." Thus, during prior interglacials, sea surface temperatures were up to 3 °C warmer, sea levels were up to 79 feet higher than the present, and up to all of the Greenland and West Antarctic ice sheets melted away. All of this occurred naturally and at "safe" levels of CO2. Thus, there is no evidence that climate change within the present interglacial is any different, unprecedented, unnatural, unusual, or due to man-made CO2. Top graph shows reconstructed sea surface temperatures over the past 425,000 years. Horizontal axis is thousands of years ago. Modern sea surface temperatures of ~17C are cooler than during the the early Holocene [past ~11,000 years] and during the past 3 interglacials, and were ~3C higher during the last interglacial ~125,000 years ago. 5 million year climate history reconstructed from marine sediment cores shows glacial-interglacial cycles have occurred every ~100,000 years over the past 1 million years. The 100,000 year cycle appears to be due to the 100,000 year solar geomagnetic cycle. Canary Islands marine deposits are ~481 ka (MIS 11 or 13) and ~130-120 ka (MIS 5.5). The older high sea stand (if it is MIS 11) could have been +9 m to as high as +24 m.
Both ages of deposits contain southern species of mollusks, indicating warmer waters. Both ages of deposits contain northern species of mollusks, indicating cooler waters. Thermally mixed faunas may be due to insolation-forced early warming, later cooling. We present the first U-series ages of corals from emergent marine deposits on the Canary Islands. Deposits at + 20 m are 481 ± 39 ka, possibly correlative to marine isotope stage (or MIS) 11, while those at + 12 and + 8 m are 120.5 ± 0.8 ka and 130.2 ± 0.8 ka, respectively, correlative to MIS 5.5. 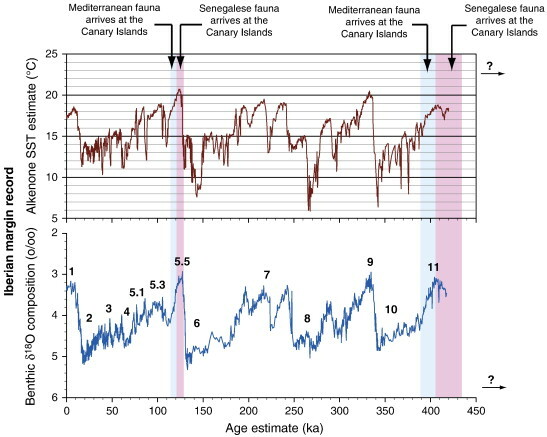 The age, elevations, and uplift rates derived from MIS 5.5 deposits on the Canary Islands allow calculations of hypothetical palaeo-sea levels during the MIS 11 high sea stand. Estimates indicate that the MIS 11 high sea stand likely was at least + 9 m (relative to present sea level) and could have been as high as + 24 m. The most conservative estimates of palaeo-sea level during MIS 11 would require an ice mass loss equivalent to all of the modern Greenland and West Antarctic ice sheets; the more extreme estimates would require additional ice mass loss from the East Antarctic ice sheet. Extralimital southern species of mollusks, found in both MIS 11 and MIS 5.5 deposits on the Canary Islands, imply warmer-than-modern sea surface temperatures during at least a part of MIS 11 and much warmer sea surface temperatures during at least a part of MIS 5.5. Both MIS 11 and MIS 5.5 marine deposits on the Canary Islands contain extralimital northern species of mollusks as well, indicating cooler-than-present waters at times during these interglacial periods. We hypothesize that the co-occurrence of extralimital southern and northern species of marine invertebrates in the fossil record of the Canary Islands reflects its geographic location with respect to major synoptic-scale controls on climate and ocean currents. Previous interglacials may have been characterized by early, insolation-forced warming, along with northward migration of the intertropical convergence zone (ITCZ), accompanied by weakened trade winds and diminished upwelling. This allowed the arrival of extralimital southern taxa from the tropical Senegalese faunal province. During later parts of the MIS 11 and 5.5 interglacials, decreased insolation may have resulted in southward migration of the ITCZ, strengthened trade winds, and re-establishment of upwelling. Such conditions may have brought about not only local extinction of the Senegalese fauna, but allowed southward migration of the cooler-water Mediterranean fauna to the Canary Islands in the later parts of interglacials, a complex palaeoclimate record that is mirrored in the deep-sea core record.